Our team are experts in cooking Spanish food using traditional and authentic recipes from Spain. We spend time cooking and preparing all our food in house and onsite at your chosen location. Food from Spain is not only very tasty and healthy, it also has a wide variety that allows you to enjoy our services again and again with new meals every time. Our tapas, meals and desserts are slow cooked which extracts, combines and enhances all the amazing flavours for you to enjoy. Paella Pan™ have over 10 years’ experience cooking Paellas all of which are gluten, nut and dairy free. We even produce our own Spanish Chorizo to protect our customers from overly processed unhealthy foods. A full vegetarian menu is available complete with Tapas, Main Dishes and Desserts all of which are full of flavour. We deliver! Delicious Spanish Cuisine to your door for an easy lunch or dinner with friends. Tapas (Spanish finger food) are perfect for those after work events when a full size meal is not required. Never tried Spanish Cuisine before? Attend one of our tasting nights to help choose your favourite dish for you next event or function. 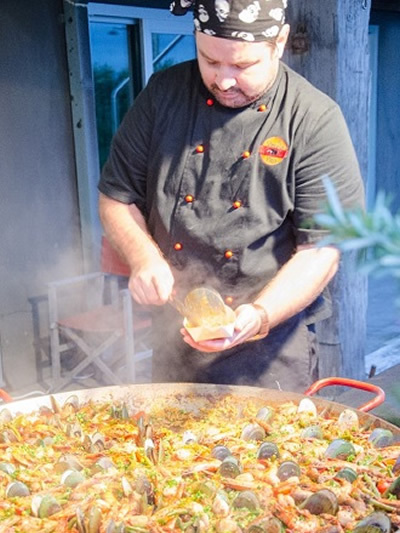 Paella Pan™ look forward to helping you make your next event or function a success. For recent client comments please read through our testimonials page.